A fully illustrated tie in to Netflix's award-winning A Series of Unfortunate Events, this mysterious volume shares insider secrets about the show and the Beaudelaire family--all packaged to look like a genuine artifact from the world of Lemony Snicket. 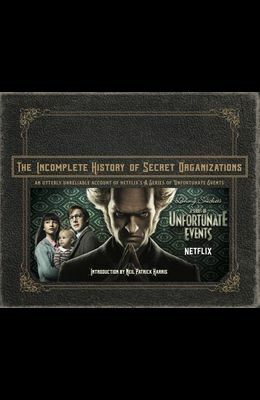 The Incomplete History of Secret Organizations is a fourth-wall-breaking deep dive into the hilariously twisted world of Lemony Snicket and the creative team that brought it to life in Netflix's critically acclaimed show, A Series of Unfortunate Events , starring Neil Patrick Harris. Modeled after a mysterious book featured in the show, The Incomplete History of Secret Organizations will include interviews with cast and crew, exclusive looks at storyboards and sketches, original photography of key sets, a collection of Violet Baudelaire's most intriguing inventions, an in-depth look at the clues and Easter eggs hidden throughout the show, a medley of the opening credit lyrics, a glossary of terms defined in the show, a collection of every disguise Count Olaf dons, annotated script excerpts, and even the Baudelaire orphans' puttanesca recipe. The ideal collectible for readers of the original book series as well fans of the hit Netflix production. Amy Schumer and Philosophy: Brainwreck!